The Armagh AC hosted event on February 15th, now in its 28th year, is considered as one of the fastest 5k events in the world and it’s a well deserved reputation as this year an astonishing 94 competitors from a field of 208 finished in under 15 minutes in the International Men’s 5k, while 34 ladies from a field of 132 finished in under 10 minutes in the 3k including the entire NI & Ulster team. Held over a lapped course, of approximately 1km per lap around the historic Mall area of Armagh City Centre the event creates a unique atmosphere that attracts athletes from all around the world. The International Men’s 5k saw a large lead group share the lead until the final lap when Jordan Mann (Ocean State AC Providence) made a surge for the line in the final straight and it looked as if the American athlete, a top ten finisher at the event last year, may hold on for a surprise victory until a late sprint from 2016 winner, Charlie Hulson (Liverpool Harriers AC) closely followed by Sam Stabler (Wreake and Soar Valley) and Orienteer Yannick Michiels (Unattached) saw all four in a race for the finish line. In a finish worthy of an International event Sam crossed the line first in 13.59, with Charlie taking second place in 14.00. Jordan held on for a podium place, crossing the line in 14.02 for third place while Yannick took fourth place in 14.02. James Edgar (City of Lisburn AC) led the Northern Ireland & Ulster team home in 14.27 (30th place). Neil Johnston (Springwell RC) ran a new Springwell RC record of 14.35 (45th place), while Danny Mooney (Letterkenny AC) and Scott Rankin (Foyle Valley AC) crossed the line in 14.43 (67th place) and 15.08 (120th place) respectively. The Northern Ireland & Ulster men finished in fifth place in the team standings, with the Wales ‘A’ team taking first place. Springwell RC’s two other representatives both had excellent runs with Jonathan McKee 145th in 15.21 and Luke Dinsmore 168th in 15.30. 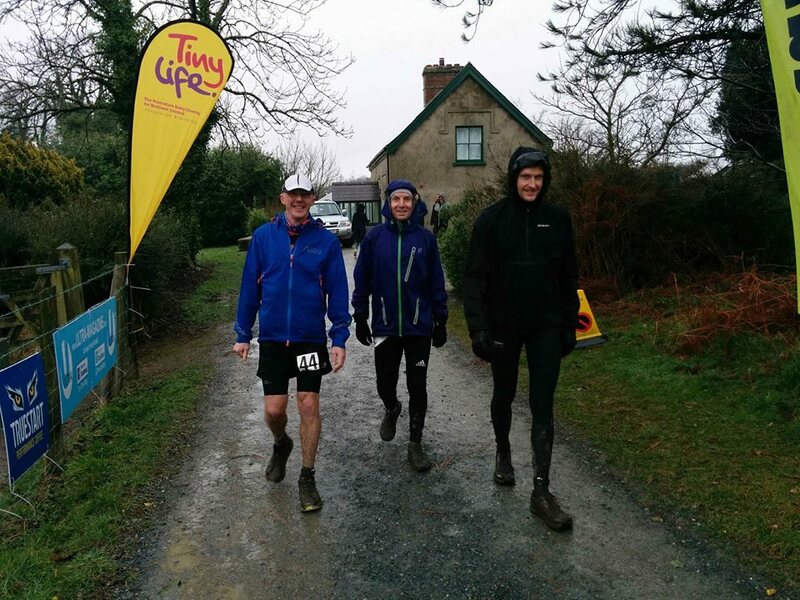 Saturday 17th February saw the latest of Atlas Running’s endurance events take place at Castleward in County Down with the ‘Last One Standing’ Competition. This is no ordinary race but the rules are relatively simple. At midday on Saturday all competitors take to the start line and have one hour to complete a 4.2 mile lap of the grounds. It’s entirely up to each competitor what pace they run at as long as they are back at the start line by 1.00 pm to start lap 2. Any competitor who doesn’t complete their lap within the hour is eliminated from the race. The race continues in this manner with each lap starting on the hour until only one runner remains. To claim the title that runner then has to complete a single lap on their own. 98 competitors started the event on Saturday and as the race progressed that number was gradually reduced and at midnight 63 runners remained. The next eight hours were to prove very difficult as fatigue and the body’s natural desire to sleep took their toll. At the start of loop 21 at 9.00 am only 16 runners remained. Amongst that 16 was Springwell RC’s Peter Cromie, who had started the event as one of the favourites. It was on loop 24 that last year’s winner of the ladies race, Louise Smart was left as the only lady standing so, after completing loop 25 she retained her title. Loop 24 is the 100 mile mark for competitors, and a number see this as their target and withdraw from the event at this stage. 2018 was to be no exception as only six runners came to the start line for loop 25. At the start of loop 29, with 117.6 miles completed only three runners came to the start line. Peter Cromie (Springwell RC), Stuart Wilkie (British Spartathlon Team) and the winner of the Florencecourt Last One Standing in August 2017, Bobby Irvine (Seapark AC). As the weather deteriorated and darkness fell the head torches came out again as all three competitors started loop 31. While all three runners finished loop 31 Stuart Wilkie decided that he would not start loop 32 so it was left to Bobbie Irvine and Peter Cromie to continue the contest into the night. By the end of loop 33, with 138.6 miles completed the rain may have stopped but there was no sign of either of these runners deciding that they’d had enough, and at 9.00 pm they started their 34th loop of Castleward. It was loop 34 that was to be the deciding loop. Peter finished with 6 minutes to spare and, while marshals and spectators watched on the clock ran down past the hour mark and Bobby Irvine, while finishing the lap was timed out. This left Peter to complete loop 35 on his own within an hour to be declared ‘Last One Standing’ after 147 miles and 35 hours of running. With the end in sight Peter completed his final loop at a quicker pace finishing with sixteen minutes to spare. A truly amazing piece of endurance running by Peter and a very worthy winner. Sunday 18th February saw the latest event in the East Antrim Marathon series on the Station Road course in Greencastle on the shores of Belfast Lough. Springwell RC’s Helena Dornan had an excellent run to record a ‘good for age’ time of 3.48.35 to win the ladies race. Springwell RC’s Helena Dornan receives her first place award from EAMs organiser Peter Montgomery. Sunday 18th February was the penultimate race in event Management Company Born 2 Runs, ‘Run Forest Run’ series of events, with the Gosford Par 10k. 470 runners took to the roads and trails of picturesque woodland and open parkland surrounding Gosford Castle. Springwell RC’s Janet Patrick had another good run finishing 178th in a time of 54.40 to take second place in the F55 age category. Andrew Kincaid ran a 55.05 to finish 203rd.